A new school year—even in Sherman’s 100+ degrees in 2011—symbolizes the beginning of fall, though the official first day of autumn comes several weeks later. Many suddenly are ready for “football weather” and jackets. A new academic year also means school supplies—nostalgia for a new box of Crayola crayons seems to fall upon many each September—though they have not colored in years. How many adults buy themselves a few “school supplies” each fall? 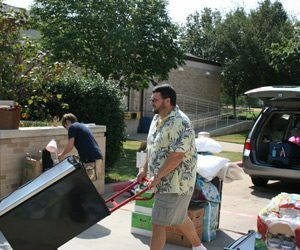 For many alumni and parents of current students, the start of school brings thoughts of their own arrival at college. Not too many years back, students packed a few belongings in the car, waved goodbye, and headed off on their own. Maybe they called their parents when they arrived; it might be weeks before they spoke again. 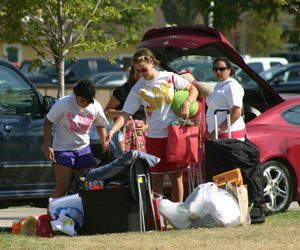 These days, going to college involves weeks of making lists and packing, a two-or-three-vehicle caravan (if not a U-Haul), and two days of parent activities on campus, plus cell phone calls and texts even before mom and dad have pulled away from the curb. But, times change. The students who packed a “few belongings” might have transported clothes, a few books, maybe a television or stereo system, and that’s about it. Today’s students have computers, scanners, printers, gaming systems, e-books, refrigerators, flat screen TVs, DVD recorders, and an accompanying mass of wires, chargers, and cables (the lucky ones have wireless systems). Still the excitement of those first days remains the same. Even returning students are anxious to get back into the routine, see friends face to face versus Skype and FaceTime, start a new course of study, settle into a new living space. Faculty and staff, too, anticipate the arrival of freshmen and returning students. Austin College does Opening of School in grand style. 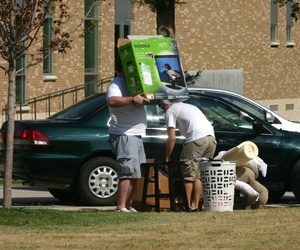 Student Development Board (SDB) members still surge around a car as it pulls in front of a residence hall—and sometimes unload the car before the parents fully understand what’s happening. Curb time is short, and those same SDB volunteers quickly help transport boxes and bags to the freshmen rooms. (Of course, this special service is for freshmen only; everyone else carries their own belongings!) A packed few days of orientation for parents and freshmen follow; parents leave campus; students have more time to get acquainted with their residence hall clusters and Communication/Inquiry groups; they register for classes; and then one of the traditional Austin College community events arrives: Opening of School Convocation. Faculty members arrive in full academic regalia; seniors are in caps and gowns; freshmen lead the procession into Wynne Chapel. Speeches, prayers, academic integrity pledges, more speeches, banners, one more blessing, and the new class is officially matriculated. Seniors cross the street to the President’s Home for the Senior Salute with a toast to the new year—their final year—from President Marjorie Hass. The new year is begun.